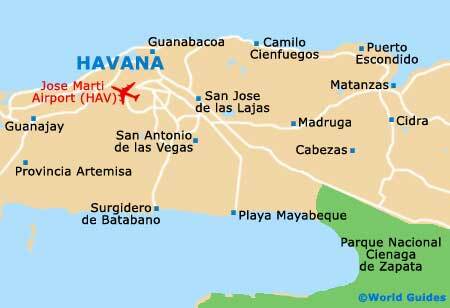 Getting to Havana is by way of the main Jose Marti International Airport, with flights via the USA. It is connected to the city by taxi and hotel shuttle bus transportation. Boat travel to Cuba is not a viable option. Public transport is thin on the ground within Havana and most tourists stick to the taxis if they need to travel about. Buses are also available, but they are usually crowded and slow. It is best to hire a car if you intend to explore Cuba, as bus and train travel around the country can prove unreliable and time consuming. Jose Marti International Airport is the main gateway to Cuba and is located 20 km / 12 miles to the south-west of Havana, being connected by the Avenida de la Independencia. This busy facility has three terminals, strict customs officials and a slow baggage system. Cubana de Aviación is the local airline and offers both domestic and international flights, including the popular Cuban destinations of Baracoa, Camaguey, Cayo Coco, Cienfuegos, Guantanamo, Manzanillo, Nueva Gerona, Santa Clara, Santiago de Cuba and Varadero. Other prominent airlines based at Jose Marti include Aero Caribbean, Aerogaviota, Air France, Blue Panorama Airlines, Livingston, TAAG Angola and Virgin Atlantic Airways. Metered taxis run to the city from the airport and there are also car hire booths to hand. Due to Cuba's pretty dire public transport network, hiring a car is the best way to go if you plan on seeing any more of the country. Rental cars are quite pricey, though, and fuel stations few and far between, with the most easy to find being located on the Malecon, the Avenida de la Independencia, and in the Vedado area (Calle 17). New cars are readily available despite the 'Yank Tank' stereotype. Hire cars can be pre-booked online and there are plenty of rental outlets around the city, such as Cubacar, Havanautos and Rex Rent a Car. Book your Havana Car Rental here. Buses provide the main way to travel about Cuba at large, although not Havana itself. Long-distance bus transport runs between the capital and all major towns. There are also a couple of bus systems designed for getting about the city, known as 'guaguas' and 'camellos'. However, these buses are generally crowded, rather rickety and slow. Tourists tend to favour the Havana Bus Tour, which offers a convenient hop-on / hop-off service and starts at the Parque Central, near to the Hotel Inglaterra. The trains are off and on in Cuba, and services from nearby towns are usually quite slow. Cienfuegos is a ten-hour trip, for example, while there is also an overnight train from Santiago de Cuba that takes in Matanzas and Santa Clara. An overnight service comes in from Pinar del Rio as well and is often popular. Train transport generally runs every other day from a given destination. Taxis offer the best option for getting about Havana and many of them are the old American 1950s type (Yank Tanks) that you always see in the movies. Stick to the licensed, state-run taxis, as it is supposedly illegal to travel in the others. Of note, tips are in the region of ten percent. For a more intimate and memorable experience, the so-called bici-taxi is a two-seater rickshaw and these are ideal for short journeys. Regular passenger ferries travel across the harbour throughout the day, departing from the Muelle Luz, on the south-eastern side of the Habana Vieja area. These ferries link nearby destinations such as both Casablanca and Regla, and provide a very scenic way to get around, although do expect stringent security checks as you board.